COPENHAGEN, Denmark -- The "Alternative Nobel" was given to four people Tuesday for their "courageous work" in human rights, public health and good governance. The prize foundation announced the 2017 winners as Indian human rights lawyer Colin Gonsalves, Azeri journalist Khadija Ismayilova and Ethiopian lawyer Yetnebersh Nigussie. American environmental lawyer Robert Bilott was given an honorary award. The three others share a cash award of 3 million kronor ($374,000). The award's official name is the Right Livelihood Award. Gonsalves was cited "for his tireless and innovative use of public interest litigation over three decades to secure fundamental human rights for India's most marginalized and vulnerable citizens." The Stockholm-based award committee said Ismayilova had shown "courage and tenacity" in exposing corruption in her native Azerbaijan "through outstanding investigative journalism in the name of transparency and accountability." Nigussie was tapped "for her inspiring work promoting the rights and inclusion of people with disabilities." The award committee cited Cincinnati attorney Bilott "for exposing a decades-long history of chemical pollution, winning long-sought justice for the victims, and setting a precedent for effective regulation of hazardous substances." 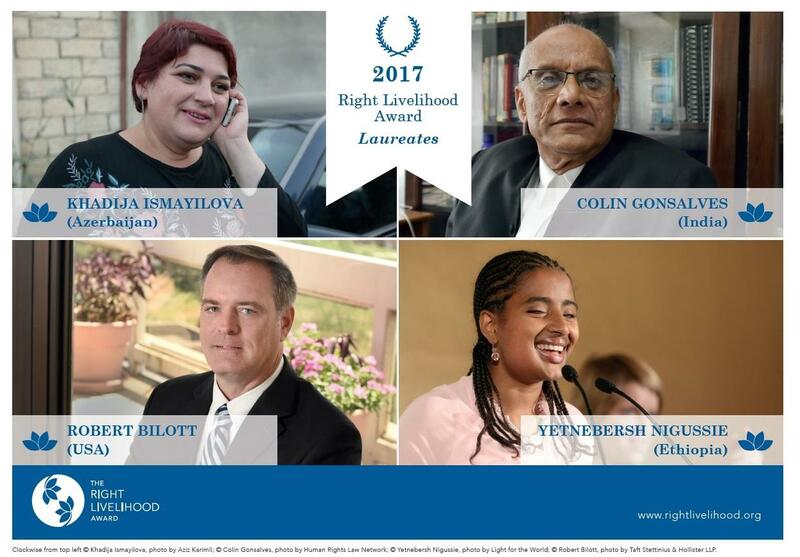 In a statement issued by the foundation behind the Right Livelihood Award, the recipients said they were honored to get the prize that is awarded once a year. It "comes at a time when India is going through a dark period and human rights activists are under siege," Gonsalves said, while Bilott hoped the award would help "spread awareness and recognition of the urgent need to take further steps to protect our drinking water, and the ability and power of local residents and communities to ensure that such steps are taken." Named after the Buddhist concept of Right Livelihood, the prize has been given in the past to former National Security Agency contractor Edward Snowden, human rights activists Bianca Jagger from Nicaragua, and Swedish children's book author Astrid Lindgren. Last year, the prize went to the Syria Civil Defense group, also known as the White Helmets, together with activists from Egypt and Russia, and Turkish independent newspaper Cumhuriyet.